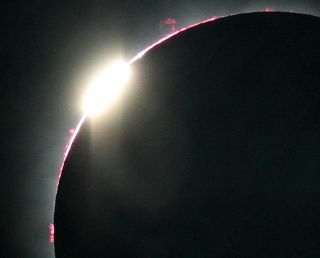 This close-up view of the July 11, 2010, total solar eclipse's second diamond ring reveals a number of prominences as well as the pinkish layer of the sun’s atmosphere called the chromosphere. After a gap of more than two years, a total eclipse of the sun will be visible this week from northeastern Australia. Residents and visitors in Cairns in Queensland will see the moon completely cover the sun for two minutes in the eastern sky shortly after local sunrise. Australia's total solar eclipse this week will occur at sunrise on Wednesday, Nov. 14 local time, though it will still be Tuesday afternoon (Nov. 13) for observers in North America tracking the event through webcasts. Veteran eclipse chasers Imelda Joson and Edwin Aguirre observed the July 11, 2010, total solar eclipse from Tatakoto, a tiny isolated atoll in French Polynesia’s eastern Tuamotu Archipelago about 800 miles (1,200 km) east of Tahiti. Due to strict size and weight limits on luggage for the chartered flight from Tahiti, their photographic gear had to be light, compact and portable. This solar eclipse Down Under is followed by two more solar events in 2013 — an annular, or "ring of fire," eclipse on May 10, which can be viewed from northern Australia, Papua New Guinea, and the Gilbert Islands, and a special “hybrid” eclipse (a combination of annular and total solar eclipse) on Nov. 3, which will be visible from the African nations of Gabon, Congo, Uganda, Kenya, Ethiopia, and Somalia. Choose the right optics and mount: To capture detailed, close-up shots of the eclipse’s partial phases, Baily’s beads, diamond rings, solar prominences, and inner corona, you’ll want a telephoto lens or telescope of sufficient focal length, say, 500 to 1,000 millimeters (or even longer). This will give you a reasonably large image of the sun’s disk in the frame. Make sure your tripod and head are sturdy enough to carry the load of your telescope and camera gear and that the tripod would fit inside your carry-on or check-in luggage. Carbon-fiber tripods are stronger and lighter than regular aluminum tripods, but they cost a lot more. Keep your setup light and portable: Try to keep your photo gear as portable, compact, lightweight, and easy to assemble and operate as possible. Portability is essential if you need to move hastily to a different site to escape clouds. Warning: Never look directly at the sun, either with the naked eye or through telescopes or binoculars, without the proper filters. To safely view solar eclipses, you can purchase special solar filters or No. 14 welder's glass to wear over your eyes. Standard sunglasses will NOT provide sufficient protection. Have extra memory cards and batteries handy: Don’t skimp on memory cards. Use a reliable, high-speed, large-capacity (8 gigabytes or more) memory card when shooting the eclipse. Don’t forget to use fresh battery for your camera. Digital SLR cameras can easily drain their batteries, especially if you use the LCD screen continuously. Make sure you use a fully charged battery at the beginning of the eclipse, and have a spare one handy, just in case. Before packing their gear for the July 11, 2010 solar eclipse, Imelda Joson and Edwin Aguirre like to lay out all their telescopes, lenses, cameras, tripods, laptop computer, and accessories on the floor. Test your imaging setup: Try out your actual gear before leaving the country. This will reveal any potential problems with focusing, balance, or vibrations, as well as internal reflections or vignetting in the optics. Practice your imaging sequence over and over so you can time your pace and refine it as needed. Take some test shots of the sun to determine the best exposure to use for your particular telescope/camera/filter combination. Pack your things carefully: When disassembling your gear, carefully pack each part so you don’t leave behind any essential screw, adapter, or cable. Also, place delicate optics and cameras in your carry-on baggage to ensure safe handling. Check with your airline or travel agent regarding baggage size and weight restrictions to avoid problems or delays during check-in and boarding. Also allow ample time for airport security screening. Register your equipment: If you are bringing along expensive telescopes, cameras, or computers, you can register your equipment with the U.S. Customs prior to your departure. You have to bring them to the local customs office at the airport, where you need to fill out CBP Form 4457 “Certificate of Registration for Personal Effects Taken Abroad.” An officer will then stamp and the sign the form, which you need to present upon your return home. More Information here. Check your location: Make sure your chosen observing site lies within the eclipse track. Depending on the weather forecast and road conditions or accessibility, select a site that is as close to the track’s central line as possible to gain the maximum eclipse duration. Double-check your exact geographic coordinates using a GPS receiver or a detailed map — you don’t want to travel halfway across the globe only to miss seeing the eclipse by a few miles! Monitor the weather: Get the latest weather update or satellite images and animations from the Internet to help you plan on where to go in case clouds or rain showers threaten your intended eclipse observing site. Automate your imaging: Many eclipse chasers now use custom software that let them preprogram their entire imaging sequence in their laptop computer. Using USB or FireWire (IEEE 1394) connection, they let the computer control their digital SLR camera from start to finish. The captured images are then automatically downloaded and saved into the computer’s hard drive. All the eclipse chasers have to do is to sit back, relax, and enjoy the show. For example, for Windows users there’s Eclipse Orchestrator. For Macs, there’s the freeware Umbraphile. Protect your eclipse images and video: Immediately after the event, remove the memory card from your camera or camcorder, label it, and back up the eclipse images or video by copying them into your computer’s hard drive or pocket flash drive. If you’re using videocassette tape for your camcorder, remove the tape for safekeeping; don’t forget to label the videocassette and “lock” it or break its tab so you can’t accidentally erase your recording. Conduct public astronomy outreach: A solar eclipse is a perfect opportunity to enlighten the locals about astronomy and space exploration. If you plan to arrive a few days before the eclipse, make arrangements to give talks at a local school or astronomy club and bring a small solar telescope for the students, teachers, parents, and club members to observe with. Don’t forget to bring extra eclipse glasses so you can share the experience with the public. uring the July 11, 2010, total solar eclipse, veteran eclipse chasers Imelda Joson and Edwin Aguirre distributed eclipse glasses to residents of Tatakoto Atoll in French Polynesia so they could safely enjoy the celestial show. Learn about the host country and its people: Solar eclipses crisscross some of the best destinations in the world. Depending on your budget and time, you can use the eclipse trip to explore a country you’ve never visited before. Try to learn more about its people, culture, language, and history, sample its cuisine, and visit its top natural attractions. Good luck and clear skies on Eclipse Day! Editor's note: If you are in Australia or along the solar eclipse path and snap an amazing photo of Tuesday's total solar eclipse that you'd like to share for a possible story or image gallery, please send images, comments and location information to managing editor Tariq Malik at tmalik@space.com. ­­Imelda Joson and Edwin Aguirre are veteran eclipse chasers and photographers with 10 successful expeditions to date (eight totals and two annulars). Follow SPACE.com on Twitter @Spacedotcom. We're also on Facebookand Google+.